Hotel Collins. opening in mid-December, 2009 - Hobart's newest luxury 4.5 star hotel and apartments in the heart of the CBD, overlooking the Hobart waterfront with views of Mount Wellington from the Hobart business district, close to the Theatre Royal, Royal Hobart Hospital, Constitution Dock, Salamanca Place and all Hobart city sights. 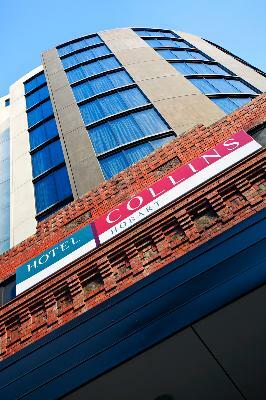 Hotel Collins will enhance your Tasmanian experience whether at work or on holiday. Nearby Attractions : Hotel Collins is only a short walk away from the vibrant Hobart waterfront, including several of Tasmania's leading restaurants, the Tasmanian Museum and Art Gallery, Visitor Information Centre and Salamanca Place. Hotel Collins is also located close to such places of interest as the Victoria and Constitution Docks, Theatre Royal, Royal Hobart Hospital, Queens Domain, Royal Botantical Gardens, Domain Tennis Centre and Hobart Aquatic Centre, Visitor Information Centre 100m, Theatre Royal 100m, Constitution Dock 100m, Salamanca Place 500m, Museum 50m, Royal Hobart Hospital 20m, Royal Botanic Gardens 1km, Hobart Private Hospital 20m and Hobart Airport 15km. 1 Bedroom Apartment : Sleeps up to 3 guests on 1 King Bed & 1 Rollaway Bed Extra. 2 Bedroom 2 Bathroom Apt : Sleeps up to 5 guests on 1 King Bed & 2 Single Beds Or 2 King Beds & 1 Rollaway Extra. Deluxe Queen Room : Sleeps up to 2 guests on 1 Queen Bed. King/Twin Hotel Room : Sleeps up to 2 guests on 1 King Bed Or 2 Single Beds . Queen Room : Sleeps up to 2 guests on 1 Queen Bed.